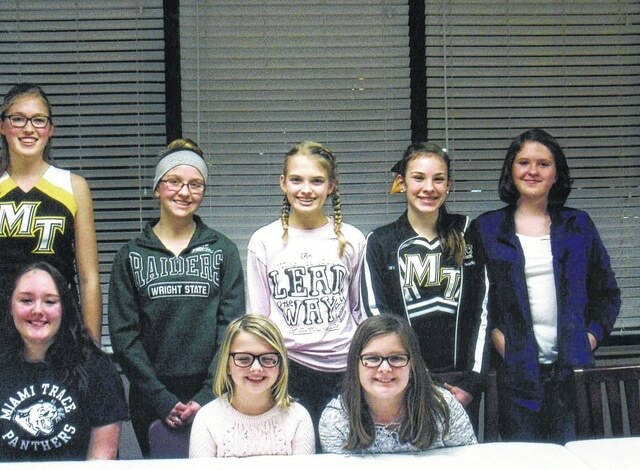 The All-N-One 4-H Club elected officers for 2017 at their first meeting, which was held on Jan. 17 at Kroger. They are (bottom row) safety officers Taylor Perkins, health officer Cali Kirkpatrick, community service officer Peyton Johnson, (top row) treasurer Andrea Robinson, president Skylynn Barden, secretary Hidy Kirkpatrick, vice president Madison Johnson and historian Mary Gerber. Absent from the picture were news reporter Lorelei King and environmental officer Lucas King. https://www.recordherald.com/wp-content/uploads/sites/27/2017/02/web1_img519.jpgThe All-N-One 4-H Club elected officers for 2017 at their first meeting, which was held on Jan. 17 at Kroger. They are (bottom row) safety officers Taylor Perkins, health officer Cali Kirkpatrick, community service officer Peyton Johnson, (top row) treasurer Andrea Robinson, president Skylynn Barden, secretary Hidy Kirkpatrick, vice president Madison Johnson and historian Mary Gerber. Absent from the picture were news reporter Lorelei King and environmental officer Lucas King.